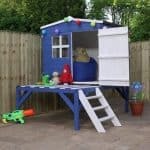 With a 4x4ft interior the Mad Dash Blueberry Wooden Playhouse is a fantastic option for the younger child looking for their very first playhouse. 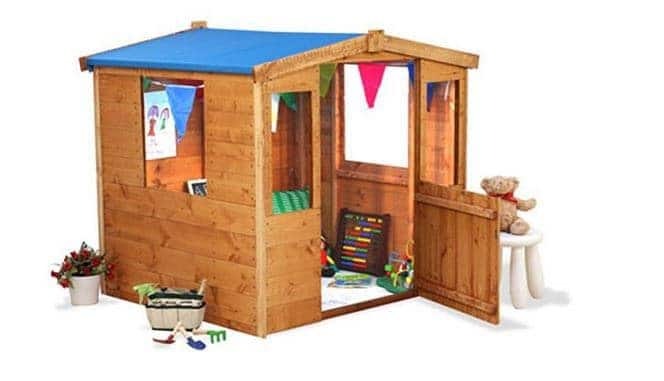 In a traditional style with a charming stable door and picket fenced area to the front, this playhouse will be enjoyed by your little one on many sunny days. This is an amazing value wooden children’s playhouse and perfect for sunny days when the kids are outside and want to let their imagination go. Complete with a stable door, a bright blue fabric roof, picket fence and feature windows it is suitable for both boys and girls. You can personalise the playhouse too by adding paint and enhance it with little extras such as a chairs and bunting. 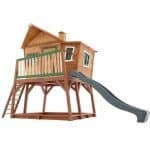 This is also an excellent affordable choice, easy on the pocket making it a wise choice playhouse. The open window design on each side of the playhouse provides a light and airy feel, as well as allowing parents to keep an eye on younger children whilst they play inside with their toys or with friends. With many features for the younger child to enjoy, this is a superb basic playhouse model that is available for those with a lower playhouse budget. The Mad Dash Blueberry Wooden Playhouse: How safe is it? 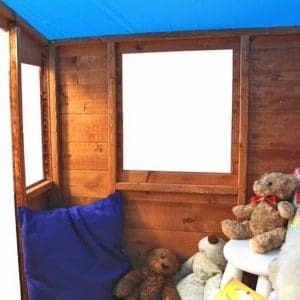 Along with our recommendation that the Blueberry playhouse be considered for smaller children in particular, in this section we identify and discuss any safety concerns that parents and carers may have pre-purchase. We will also take a look in further detail at any interesting features that this particular playhouse may have, and help you make an informed decision when choosing the right playhouse for your child. 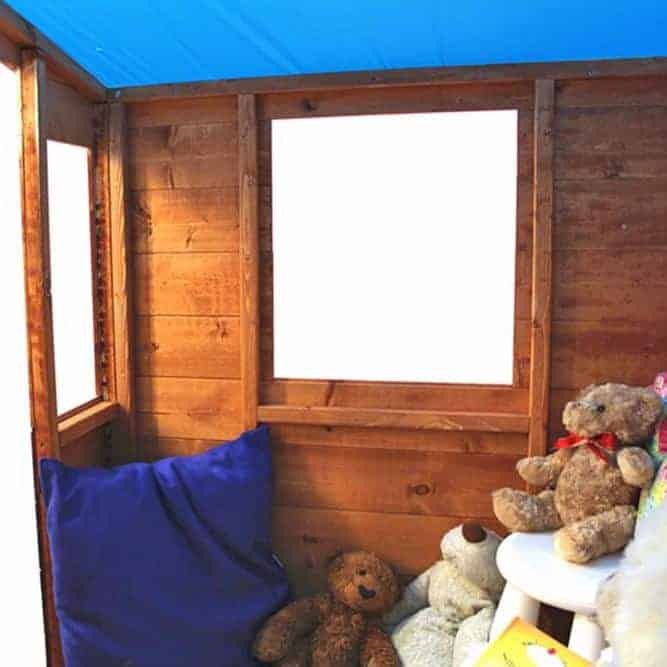 Playhouse: With a compact 4x4ft interior and 3ft10 height, we feel that this playhouse is best suited to the younger child. Of course older children will still enjoy the playhouse but may find the space and height limited in its use. Windows: The large windows on three sides of the playhouse make this model very light and airy and allow parents high visibility inside to keep an eye on younger children. The only safety concern we could see here was that older children may think it fun to climb through the windows, given the size. Door: The large and wide door area provides an easy access for active children, with only a half door to contend with. The only concern with the door would be that there is no handle present and therefore care must be taken to avoid trapped fingers. Picket-fenced area: The picket fenced area to the front of the playhouse provides a nice area for your child to maybe grow their own flowers or plants and learning to enjoy their natural surroundings. The Mad Dash Blueberry Wooden Playhouse: How easy to build? 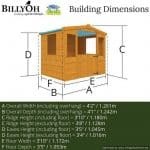 The Mad Dash Blueberry playhouse will arrive at your door in a flat-pack package containing all of the wooden panels, roofing material, fencing, fixtures and fittings required for assembly. Mad Dash recommends that for safety reasons two people work on assembling this playhouse together; although due to its smaller size and simple construction, it would be possible for one person to assemble it. A thorough set of instructions will be provided with detailed wording and easy-to-follow diagrams to help you glide through the assembly process. 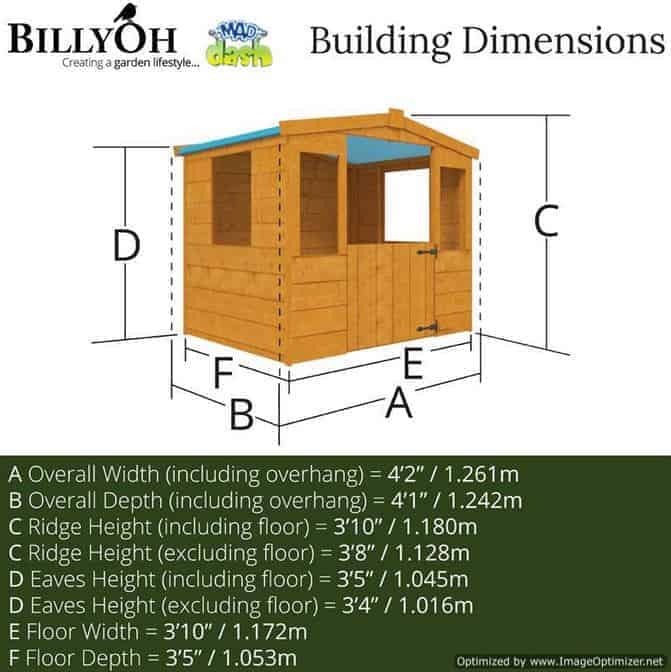 We expect this playhouse could be built within a day with a general DIY knowledge. The Mad Dash Blueberry Wooden Playhouse: What is the overall quality like? 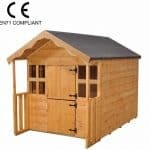 You may be wondering what the quality of the Blueberry playhouse is like given the very affordable price. The simple answer to that question would be – great quality. The lesser price here does not at all reflect the quality of the construction or materials used. The playhouse is made from a high quality timber with rounded and smoothed edges for safety during play. Due to the nature of the open windows and door area, the interior is not weatherproof, however the timber is weather resistant and will stand up to even the harshest of weathers. 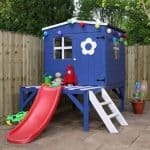 If you wish to paint your Blueberry playhouse that is indeed possible, whether you want to transform it into a little boys’ hideout or a fairy tale cottage, decorate as far as your imagination will take you. Some even add personalised details such as their child’s name on a plaque on the door or bunting and similar decorations. 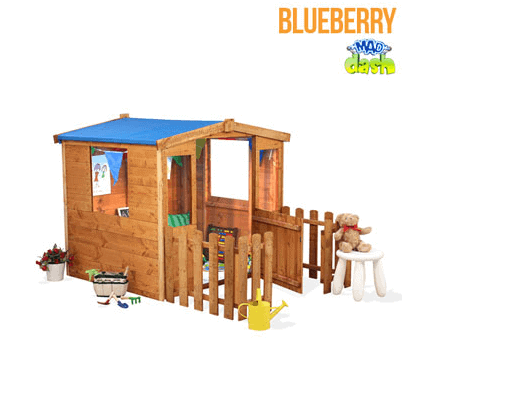 The Mad Dash Blueberry Wooden Playhouse will be a big hit amongst those kids looking for a little house and garden area of their very own within the comfort of your garden. 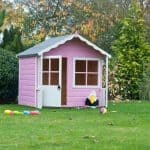 With its 4x4ft interior space, we feel that this particular playhouse would be best suited to younger children, with a size of house that would suit their needs. 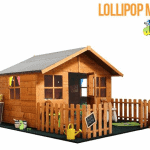 At a very affordable price, this stylish hideaway looks more expensive than it is and has all the features of more expensive playhouses in similar ranges. A winner for the little person in your life!